Indian cricket plunged into a fresh controversy with a television channel today disclosing that coach Greg Chappell and Virender Sehwag were involved in a feud during India’s disastrous tour of South Africa. England beat New Zealand by 14 runs at the Gabba in Brisbane today to join Australia in the tri-series one-day international finals. Paul Collingwood smashed 106 and Andrew Strauss 55 as England recovered from a slow start to amass a formidable total of 270 for seven from their 50 overs. Having impressed with his batting skills, Dinesh Karthik says he has now matured as a cricketer and was confident of “delivering the goods” if selected in India’s World Cup squad. Australian cricket captain Ricky Ponting today sounded a warning to opponents when, after a stellar year, he said he hasn’t yet reached his best. Within days of his return to the Pakistan team, Shahid Afridi finds himself in the eye of storm for allegedly trying to hit a spectator with his bat after being dismissed in the first ODI against South Africa at Centurion. Indian-born Australian woman cricketer Lisa Sthalekar has been named Women’s International Cricketer of the Year at the coveted Allan Border medal ceremony, the most important cricketing award in Australia. The Indian Olympic Association today said that all possible measures to check doping offences will be taken at the 33rd National Games in Guwahati. Government College, Ludhiana A, Sports Wing, Kairon, and Khasla College, Ludhiana A, entered the quarterfinals of the Western Union Six-A side Punjab Hockey League (Women) here today. Karate black belt Hemant Sharma has been selected to participate on behalf of Haryana in the 33rd National Games to be held in Guwahati. Apart from the heated argument between Chappell and Sehwag, there were also serious differences while selecting the team for the Test matches, according to Times Now. The sensational disclosure comes just two days before the one-day series against Sri Lanka gets underway in Kolkata where Sehwag was expected to make a comeback. The channel, quoting team manager Chetan’s Desai’s confidential report to the BCCI, said the argument between Chappell and Sehwag occurred when the out-of-form opener refused to attend a special practice session on the eve of the Durban Test. When contacted, BCCI secretary Niranjan Shah said the manager’s report was with President Sharad Pawar and he had no comments to make at this stage. “I don’t want to say anything on it. The manager’s report is with the President”, he told PTI. “All I can say is that Sehwag was not dropped because of any disciplinary issue. He was dropped purely on form,” he said. 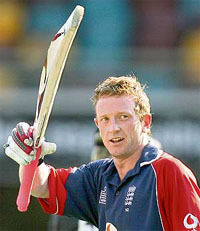 The report said Chappell and expert bio-mechanist Ian Fraser came to the nets but did not find Sehwag. 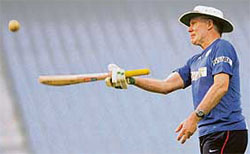 Later Sehwag told Chappell that he did want to practice which angered the former Australian captain. Desai’s report also claimed that paceman Munaf Patel was not fully fit to the play in the third Test and held captain Rahul Dravid largely responsible for the defeat in that crucial match in Cape Town. Desai claimed that physio John Gloster hid Munaf’s injury till the last which allowed him to play in Cape Town. Giving instances of differences during selection meetings, the team manager said in his report that Dravid insisted on having Sehwag in the team despite his poor form. “In that meeting after a lot of deliberation, it was finally decided to drop Sehwag. The next day Dravid during the practice session suggested that after seeing the wicket he was of the opinion that it would be a spinners’ track and he would want to have Sehwag as the next option as a spinner,” he said in his report. “I objected and told Greg, Dravid and Dilip (Vengsarkar) that if it was a spinners’ track, they could have Harbhajan in the team. Greg mentioned that Harbhajan was not bowling well. At this point I said if Harbhajan is not in the team, then why Sehwag, who is not batting well, is in the team. “Vengsarkar mentioned to Dravid if Sehwag failed and India lost the match there would be heavy backlash back home to which Dravid replied that he was prepared for it,” he said. Desai, when contacted, declined to comment, saying he had submitted his report to the BCCI President and the matter was closed as far as he was concerned. In his observations, Desai said the senior Indian players were not as fit as their South African counterparts. “The support staff, specially the trainer and the physio, need to give report as far as the fitness and the injury of an individual player was concerned from time to time to the board”, he said in his report. Desai praised Chappell and said he was doing a “wonderful job”. “Chappell is a gentleman to the core but needs extra courage from the Board so that he can make his independent decision. Chappell needs to be given a lot of confidence by the Board”, he said. Kolkata: Not willing to take any chance after Indian team coach Greg Chappell’s was assaulted in Bhubaneswar, the West Bengal government has made ‘fool-proof’ security arrangements for the Aussie in view of the first India-Sri Lanka ODI at the Eden Gardens here on Friday. “Fool-proof security arrangements have been made for Chappell,” state Home secretary P R Roy told newspersons at the secretariat. Police commissioner Prasun Mukherjee, also the Cricket Association of Bengal president, is personally supervising the security arrangements for the players, officials and other VIPs. Kolkata: The Indian and Sri Lankan cricket teams today arrived to a tumultuous welcome in the city for the February 8 one-dayer at the Eden Gardens. The Indian players started arriving in batches since last night from various parts of the country while the Sri Lankans landed here at 12.40 pm from Mumbai. Among the Indian players, Munaf Patel came last night while skipper Rahul Dravid, Anil Kumble, Robin Uthappa and S Sreesanth reached the city from Bangalore this morning. Off-spinner Harbhajan Singh and Virender Sehwag were among those who came from Delhi. Team management said all players in the 15-member squad, except Sachin Tendulkar, Zaheer Khan and Ajit Agarkar, were already in town. The three Mumbai cricketers were expected to arrive this evening. Kolkata: A sellout crowd of 88,000 would turn out at the Eden Gardens in the opening game of the four-match India-Sri Lanka series here on Thursday following massive demand for tickets due to the return of local hero Sourav Ganguly and his fine recent form. New Zealand made a flying start to their reply with captain Stephen Fleming making 106 off 149 balls but lost their way in the latter stages to finish with 256-8. England’s hopes of making the finals seemed doomed a week ago when they lost their fourth straight match in a row but a surprise win against Australia on Friday gave them a chance of sneaking past the Kiwis. England were struggling at 52-3 in the 14th over after returning skipper Michael Vaughan was bowled by Shane Bond for a duck with a perfect inswinging yorker and Ian Bell (12) and Ed Joyce (26) both went cheaply. But Strauss and Collingwood steadied the innings with a careful display, taking the total past 100 in the 22nd over before increasing the run-rate. Strauss struck three fours and a six to complete his first half-century of the series while Collingwood survived a dropped catch from Jacob Oram on 18 to record his third one-day international hundred. The pair added 103 for the third wicket before Strauss was bowled by Scott Styris. Collingwood was then bowled by Bond after becoming distracted when his team mate Jamie Dalrymple dropped his bat at the non-striker’s end. Andrew Flintoff made a quick 17 off 15 balls before holing out to James Franklin in the deep to give Bond his fourth wicket. Wicketkeeper Paul Nixon was bowled by Mark Gillespie for a second ball duck in the penultimate over before Dalrymple (29 not out) and Liam Plunkett (15 not out) went on a late flurry to lift the total to 270. New Zealand started well when Plunkett bowled five wides in the opening over, including one that raced away to the boundary rope, as Fleming and Lou Vincent put on 81 for the first wicket. But the England bowlers succeeded in drying up the runs, forcing the Kiwis to take more risks to try and increase the rate as the wickets started to tumble. Fall of wickets: 1-1, 2-28, 3-52, 4-155, 5-191, 6-250, 7-251. Bowling: Franklin 8-1-45-1, Bond 10-2-46-4, Gillespie 10-0-52-1, Oram 7-0-36-0, Vettori 6-0-37-0, Styris 9-0-50-1. Fall of wickets: 1-81, 2-107, 3-169, 4-203, 5-208, 6-212, 7-224, 8-232. Bowling: Plunkett 10-0-60-3, Mahmood 10-0-62-0, Flintoff 10-3-37-1, Collingwood 10-0-46-2, Panesar 8-1-38-1, Dalrymple 2-0-9-0. The Tamil Nadu wicketkeeper-batsman has grabbed the opportunities that have come his way since the tour of South Africa and believes his ability to play according to the situation will hold him in good stead for the tougher challenges ahead. “I am very confident about my abilities and confident about delivering, which matters. Basically, I have the self-confidence now,” Karthik told PTI in an interview. The 21-year-old player said it was important not to get carried away by the success and he will always strive to contribute to the team’s cause. “Every day is a new day and every game is a new game. I need to play according to the situation and according to the wicket. 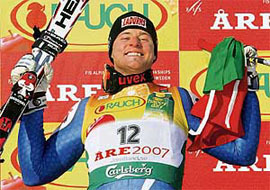 It is important that I do not get carried away and I always looking forward to contributing to the team cause,” he said. The young cricketer is now looking forward to the one-day series against Sri Lanka to make a mark and cement a place in the World Cup squad to be finalised in Mumbai on February 12. While many have questioned the logic of carrying two wicketkeepers to the World Cup, Karthik is unfazed by such arguments and says his only priority is to keep improving as a stumper and a batsman. Describing himself more as a batsman than a wicketkeeper in present circumstances, he is willing to don any role the team management wants him to perform. “As of now, I am more a batsman than a wicketkeeper as per the team management and its requirements. It is important that I concentrate on my batting and try to get runs when it matters,” he said. Karthik, who has scored 346 runs in 11 Tests and 114 in nine ODIs, said wicketkeepers have a key role to play on the field as they are in a position to give a lot of inputs to the captain and bowlers. “A wicketkeeper is the person who assesses as to what exactly happens in front of the wicket in as much as how the wicket is behaving and how the batsmen are playing. As a wicketkeeper one can note all the important points as to how one could play in such wickets. “Instead of making assessment from covers or mid-off or some other regions in a field, when you stand behind the wicket, you get the best view of the game. A wicketkeeper always gives lot of inputs to captain and bowlers,” the Tamil Nadu player said. On former cricketer and selection committee chairman Syed Kirmani’s observation that Karthik was technically more sound than other current Indian wicketkeepers, he said, “I am really honoured to get such comments from Kirmani who is one of the greatest keepers India ever had produced. Ponting was named Australia’s cricketer of the year yesterday, winning the Allan Border Medal for the third time in four years and being judged his country’s Test and one-day player of the year. Unwilling to rest on his laurels, Ponting, 32, said there may be better still to come. “I always feel that every day I go to training or every game I play I obviously want to improve and make myself a better player and a better leader,” Ponting said. “That’s the aim. Whether or not I can remain as consistent as I have over the last couple of years is to be seen, but I’ll give myself the best chance anyway.” Ponting is ranked the No 1 Test batsman in the world and, of players who have scored more than 3000 runs, his average is second only to Sir Donald Bradman’s. “My career to date has probably gone better than I would have expected,” he said. According to a report in the local daily Beeld, Afridi was caught on camera as he swung his bat at a spectator while returning to the pavilion following his dismissal at 17 in the match on Sunday. However, no complaint has been lodged against the swashbuckling all-rounder, who was recalled to the side after being out of favour for quite some time. The Pune-born Sthalekar piped Australian captain Karen Rolton by one vote at yesterday’s Allan Border Medal count to become just the third member of the Australia women’s team to win the award. Sthalekar (27) enjoyed a superb individual year with the Southern Stars, and averaged 44.71 as a top-order batter and 22.55 as an off spinner from one Test and eight limited-overs matches against India and New Zealand. In a one-off Test against India last year at Adelaide, she was the player of the match scoring 72 runs and bagging five wickets for 30 runs in the tourists’ second innings. She steered her state team New South Wales to victory in the 2005-06 Women’s National Cricket League in her first season as captain. Speaking to Indian Link, an ethnic Indian newspaper, Sthalekar said she was looking forward to playing in a one-day international tournament to be held in Chennai, India, from this month. “I am looking forward to the challenge of playing in India again,” Sthalekar was quoted as saying in the paper. “You can’t look past India on home soil - their record at home is impressive and because they are different conditions for the rest of us, it will be extremely hard.” Sthalekar, a versatile all-rounder, has been appointed vice-captain of the Australian team for the quadrangular tournament, featuring Australia, India, England and New Zealand, to be held from February 21 to March 5. “Lisa’s strength is her all-round game,” the Indian Link report quoted Rolton as saying. “She makes runs at the top of the order, even under pressure and has been in really good form lately. She can also bowl 10 tight overs (and) pick up some wickets on the way, so she’s a very valuable member of the team.” Lisa had spent just three weeks in India before her family moved to Australia, where her father introduced her to the game, when she showed promise as a backyard cricketer. Sthalekar, who works full time for Cricket New South Wales as high performance coach, also has an arts degree majoring in psychology. “We are taking serious note of the menace and will act very tough on the issue. We are taking a lot of steps,” IOA President Suresh Kalmadi said. “All state Olympic associations have been told to inform the athletes about dope sampling. The samples will be sent to the IOC-accredited lab in Bangkok because we want a correct report and that can be achieved in an IOC lab,” he said. Government College, Ludhiana A, beat Khalsa College, Jalandhar B, 10-1 and were placed on top in pool C. Rajwinder (4), Parjit (4), Mamta (1) and Manjot (1) scored while Rimpi scored for the losers. In the second match H.M.V College, Jalandhar, which had already qualified for the quarters, beat Khalsa College, Ludhiana A, 6-1 to get first place in the Pool B, though Khalsa College qualified for the quarters. For winners, scorers were Amandeep (3), Sukhmanjit (1), Vandana (1) and Baljit (1). In other matches, Sports Wing, Kairon, beat Government College, Ludhiana B, 11-1, Khalsa College, Jalandhar A, beat Khambra Academy 7-0, Alfa Nehru Garden beat Gurdaspur B 2-1 and Khasla College, Ludhiana A, beat Doaba Khalsa Model, Jalandhar, 17-0. Hemant Sharma said the Haryana team had made a place for itself among the top eight teams. The selected players would participate under the banner of the Haryana Olympic Association and the players had been provided the sports kits. The Haryana karate team comprises Hemant Sharma of Ambala in `Kata' and Mr Sanjay Bakhal of Jhajjar in 55kg category in ‘Kumite’. Mr Shiv Panchal of Sonepat will be the team coach.